Create the perfect configuration for your living room with this contemporary sectional sofa. Kick your feet up with chaise sections or keep it simple with sofa and loveseat sections connected by a corner piece. 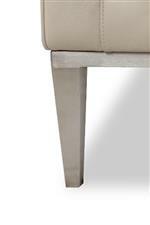 The tapered high leg bases offer a unique detail to this sectional. With hundreds of fabric and leather options available you'll be able to match the current style of your home or change things up for a fresh new look. The Henley Contemporary Sectional with Left Arm Chaise by American Leather at AHFA in the area. Product availability may vary. Contact us for the most current availability on this product. 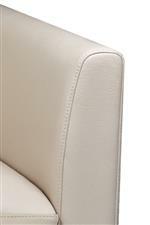 HEN-SCH-LA Left Arm Chaise Section 1 64" 36" 33"
HEN-LVS-RA Right Arm Loveseat Section 1 64" 36" 33"
Straight lines and clean edges offer this sofa collection a sophisticated look. Loose pillows and seat cushions make it easy to position yourself for the greatest amount of comfort. The high leg base will draw your eye and is available in stainless steel or one of three wood finishes. Track arms feature a slightly curved inside edge adding a unique design element to each piece. Choose the Henley collection for your living room and create a space with contemporary appeal. The Henley collection is a great option if you are looking for Contemporary furniture in the area. Browse other items in the Henley collection from AHFA in the area.